This evening I saw a writing prompt that was one word long. An interesting choice of topics, I thought, all while the wheels were turning and one distinct memory came to mind. 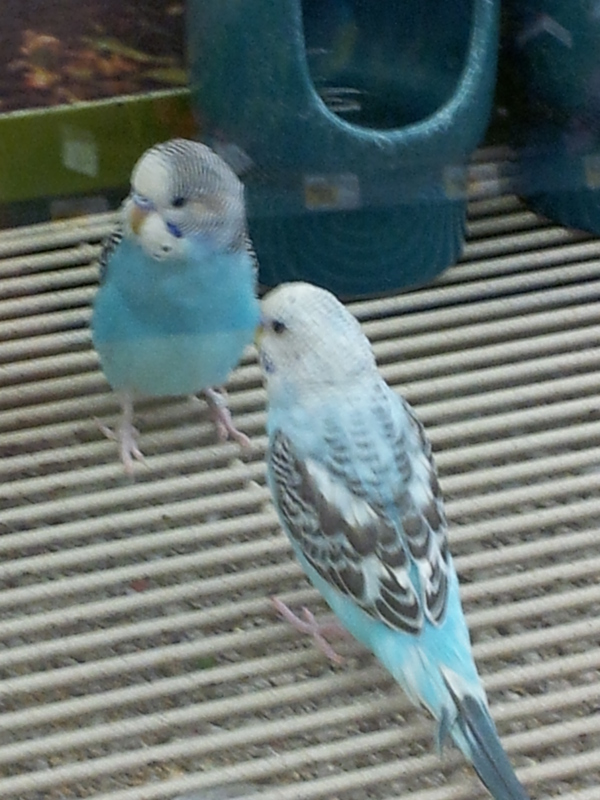 My Mama loved parakeets. With my sister’s allergies to dogs and cats, we only had them outdoors, and my sister couldn’t really be around them very much. She fell in love with birds, and so began the parakeet part of our family story. The one I remember the most was a beautiful blue and white bird who was named Chief Grey Cloud. Chief or Chiefy for short. He had more personality than a little bit. He thought he was human, and he loved my Mama. His Mama too, I guess, he would say. When she went down the hall to her bedroom, he followed her. 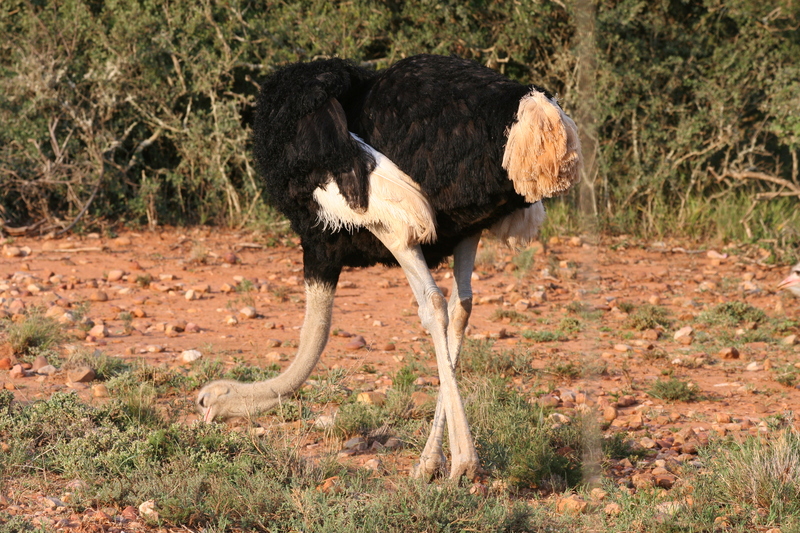 Walking and waddling behind her. He would call for her. But the funniest thing was he read the newspaper with her. Mama would sit down in her chair at the end of the table with her glass of tea. She opened the paper up and started to read. As happens with newspapers, sometimes there was a lot to read on a double page spread and sometimes very little. Chiefy would stand there on the paper, waiting for her to turn it. When she lifted the page, he would chirp and squawk and go running excitedly to the opposite side, eventually stepping off onto the table just in time for the paper to land. Then he’d hop right back on and wait for her to finish reading that page. It was their little dance, and it was funny to watch. She loved reading the paper with him, and the chirps and squawks were of happiness, not fear that he was about to be smothered by the paper. Many tears were shed when he left this world. I’m thankful for the one word prompt that brought back this memory. I am even more thankful for the picture in my mind and heart of Chiefy chirping happily and waddling/walking very quickly over to Mama to welcome her when she left this world and went on up to The House. I know that was one happy reunion. One I have not thought about before. Mostly I give thanks for the little critters in this life who bring us so much happiness. What wonderful gifts of laughter and joy they bring. May you all have someone to call for you and follow you down the hall because they love you. Love to all. 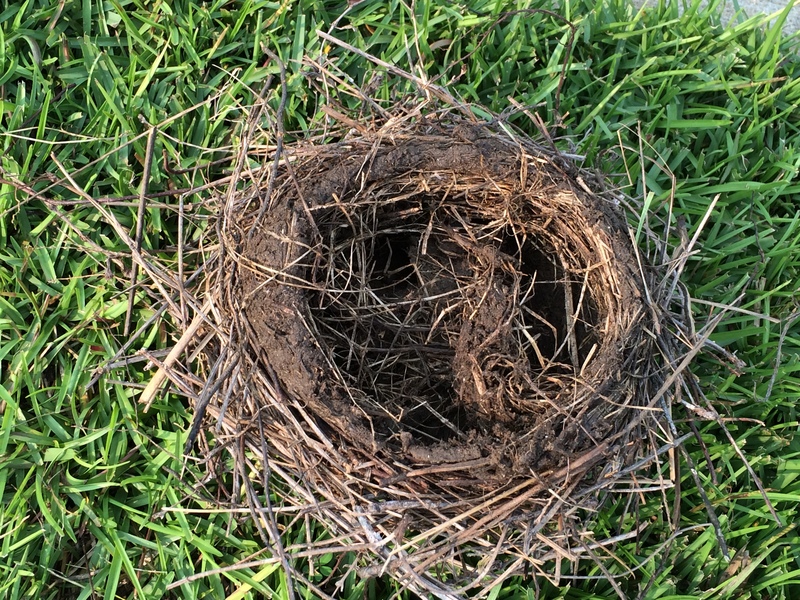 This morning as I took Miss Sophie out for her morning constitutional, we came across a bird’s nest laying on the grass. It was a solid one too. I turned it over, curious if there were any residents who hadn’t made it out safely, and there were none. I was thankful for that. I could just imagine the little bird family who once lived there being interviewed by channel CHRP newsbirds. Because interviews like that really have happened around here. A Georgia storm can come up from out of nowhere and pass just as quickly. We had a pretty powerful storm pass through here yesterday. Georgia. Where you can wait out a thunderstorm for five minutes and then the sun pops out and the only way you know for sure that it rained is the steam rising from the driveway. I guess this one lasted longer than five minutes though, because it was pretty severe there for a little bit. Especially when it knocked that nest out of its tree. I don’t think I knew enough to be afraid of storms until the big tornado came through here in the early 70’s. I remember hearing about it less than an hour after it happened, when Daddy took me through the drive-thru at Nu-Way. And of course, the sun was shining again. What really stayed with me (and this is the truth my very young self remembers) is something about the tornado going by my great grandparents’ house and being thankful they weren’t home. The tornado almost got people I love. That’s when I started fearing them. It probably coincided with me starting school and having tornado drills. Those were enough to put the fear in me for sure. I remember asking Daddy about the wisdom of getting in a ditch if I found myself on the road and a tornado came along. That’s pretty much the same thing he told the assessment nurse who came out to see if their living situation was okay for Daddy to manage after he broke his hip and wasn’t very mobile. When she asked what they would do if the house were to catch on fire or a tornado were coming or something like that where they needed to evacuate, he told her the same thing. I guess over the years, I’ve grown to respect storms and not fear them so much. They are amazing to watch, and then–in a moment–they can be over. 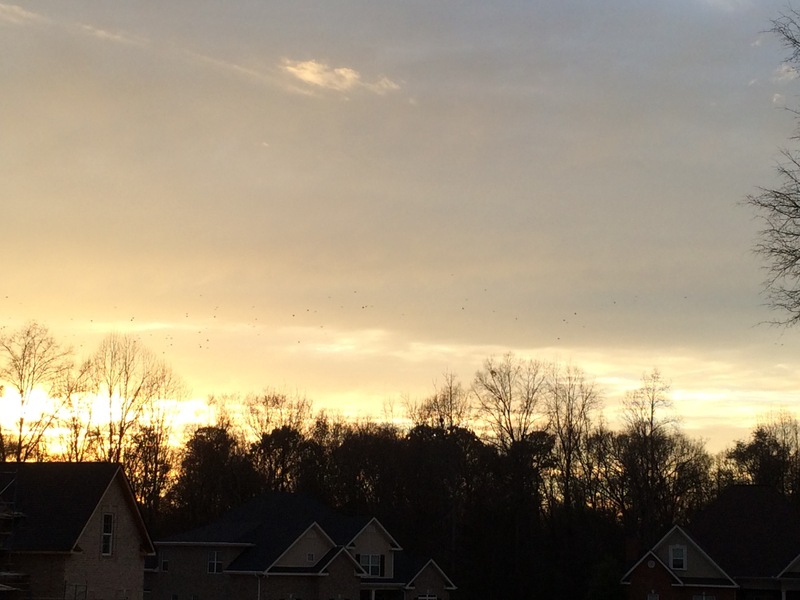 Leaving little to no debris or wrecking entire homes–of birds and people. Tonight I’m thankful that I was in a safe place with friends with a good cup of coffee when that storm hit yesterday. I’m also glad that no birds were injured from that little nest, and that they’d all already flown the coop. Most of all, I’m thankful I can still hear my Daddy’s voice and smile at the memories we have together. From the worst of storms to the sunniest of days. As long as I was with him, all was well. Wishing you all sunny skies and cool breezes. The past couple of days have been unseasonably warm here in Georgia. I’m not complaining, mind you, but while I enjoyed the warm air and I think my toes might actually have defrosted, I knew better than to trust it. Sure enough, yesterday just before dark when Miss Sophie and I ventured out, there was a nip in the air again. I thought I loved it when I was a child. I think that had to do with how it caused school to be called off. Just the threat of it sometimes was all it took. As an adult though, I do not care for it at all. Sure, it’s pretty, but it’s cold and slushy and just COLD. This morning when I took Miss Sophie out for her morning constitutional, I opened the door, and the wind and cold took my breath away. See? I KNEW it was cold. As we walked and I urged Miss Sophie to tend to her business a little faster, I listened to the birds singing. I saw the cat Domino. They didn’t need an app to know it was cold. They didn’t have an app to prepare them for this cold weather. They just existed. I wondered if they were able to read signs that our people once paid close attention to. I don’t know of many who can read the old weather signs much anymore. We depend on the News Reports and the weather apps and there’s even that whole channel dedicated to weather and all that goes with it. For goodness’ sake, I KNEW it was cold, and I still had to double-check the app. It amazes me how dependent we as a people (okay ME) have become on electronics and the internet and all of these apps. I’m not saying it’s a bad thing, but I do wonder what would have happened if I tried to pull out my phone and tell my Granny what the weather was going to be next week. I’m thinking I might have gotten an earful. The thing is today was cold. Next week (according to the app) it will be warmer. But I don’t trust it. I know March 20 is the first day of spring, but I also know that Easter isn’t until April 5. Granny always said there’d be an Easter cold snap. That’s why folks who know don’t plant their gardens until Good Friday, two days before Easter. And every single year, I’ve watched spring tease us and then step back and let that cold snap come right in and take over for a bit. Granny was right. Every single time. Without an app. Tonight I’m thankful for the birds and the cat (and all the other critters–except the snakes and spiders, I can only be so charitable) who survive and even thrive despite the cold. I’m thankful for whatever tips them off that it’s going to be cold so they can do what they need to do to be okay. I’m thankful for the wisdom of the folks from way back–knowing about things like Easter cold snaps–that they passed along the line. Most of all, I’m thankful that, even though it’s not quite here, there is a light at the end of the frozen tunnel–and its name is spring. Love and warm wishes to all. As I gazed up, breathing in the cold, crisp air, what I saw took my breath away. The river of birds at sunset. I tried to capture it, but this was a good as it got. The birds are the tiny specks you might think are bits of dust on your screen. I gave up trying to get a great shot and just watched, soaking it all in. Those blackbirds flying over in a pattern that was beautiful. They waved and wound their way through the skies overhead, their darkness in striking contrast to the brilliance of the soft and lovely sunset. I remembered the first time I heard about the river of birds–the first time I’d heard it called that. Pastor Bill talked about them as he shared stories with all of us at Miss B’s memorial service. Miss B, our elderly cousin, who passed away two years ago today. One week after Mama left this world. Such a gentle soul, who is now dancing in a beautiful bright pink housecoat with no halt in her step and whose speech is now clearer than it’s ever been. I know this with all my heart; I saw it all in a dream. And I am thankful. I am also thankful for this day two years ago, because hope was born. Again. Bubba’s new baby was born. The one so loved and anticipated by us all. He was born and we all fell in love. And fell to our knees in thanks. He had a hard start, but he’s a strong little guy, and he is a delight in our world. Two years ago today. A day that began with saying goodbye brought a beautiful hello by the time the sun set. That’s what life does. It’s never a straight cut path. It waves and winds through joy and sorrow, good times and sad. The most important thing about the journey, just as it is for our feathered friends, are the ones who travel alongside us, helping us to navigate the path. Staying beside us and moving to lead the way when we need them to. Good job, God. Thank You. And happy birthday, little one!